Sir Walter Raleigh’s first attempts at settling the New World were disastrous. The English, who were now trying to gain a foothold in the New World, were succumbing to the same greed that had earlier blinded the Spaniards. Starvation, disease, hostile Indians, and other hardships, including a whole colony lost (the Lost Colony of Roanoke), led to dampened enthusiasm for New World expeditions. It would be nearly 20 years after Raleigh’s initial ventures before enough English interest could again be sparked for more New World adventure. Despite recruiting “sermons” that contained messages of evangelical outreach, and the preamble of the Company’s charter, written by King James I, which contained the words, “…propagating of Christian religion to such people as yet live in darkness and miserable ignorance of the true knowledge and worship of God, and may in time bring the infidels and savages, living in these parts, to human civility and to a settled and quiet government,” the lust for gold was, again, what drove European men across the Atlantic. On May 14, 1607, headed by a seven-man council, which included John Smith, 144 men settled Jamestown. Because of their misguided efforts it was a disaster from the beginning. These men battled the elements, disease, Indians, starvation, and one another. The lone minister on the adventure, Robert Hunt, did his best to keep the others focused on God. His sermons went mostly unheeded; however, he persevered. By February of 1608 only 38 of the 144 remained alive. For example, of the 1,200 people who went out to Virginia in 1619, only 200 were left alive by 1620. Why this horrible continuing death rate? There is no logical explanation, except one: year after year they steadfastly refused to trust God—or indeed to include Him in any of their deliberations. The next settlers to cross the Atlantic would not make the same mistakes. They were not seeking wealth and prosperity, but a new home. 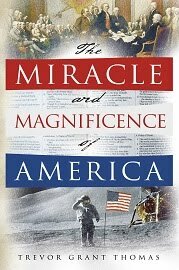 They believed that America was their spiritual destiny. The Pilgrims (dubbed “Separatists” by the Church of England), and the Puritans who followed them, knew better than to undertake anything without God. In the name of God, amen. We whose names are under-written…Having undertaken, for the glory of God and advancement of the Christian Faith and honor of our King and country, a voyage to plant the first colony in the northern parts of Virginia, do by these presents solemnly and mutually in the presence of God and one of another, covenant and combine ourselves together into a civil body politic…constitute and frame such just and equal laws, ordinances, acts, constitutions and offices from time to time, as shall be thought most meet and convenient for the general good of the colony…the 11th of November…Anno Domini 1620. John Carver, who had chartered the Mayflower, was chosen as the first governor of the colony. His was the first signature on the Mayflower Compact, which is considered by many to be the world’s first written constitution. William Bradford would soon replace Carver as governor and would serve in that capacity for 31 years. On December 21, 1620, the Pilgrims settled at what would become known as Plymouth. A replica model of the Mayflower. Created by Norbert Schnitzler. Though their efforts were “for the glory of God,” the Pilgrims were not immune to the many hardships of an untamed America. Before long, many started dying. William Bradford’s wife Dorothy was among the casualties as she fell overboard and drowned. 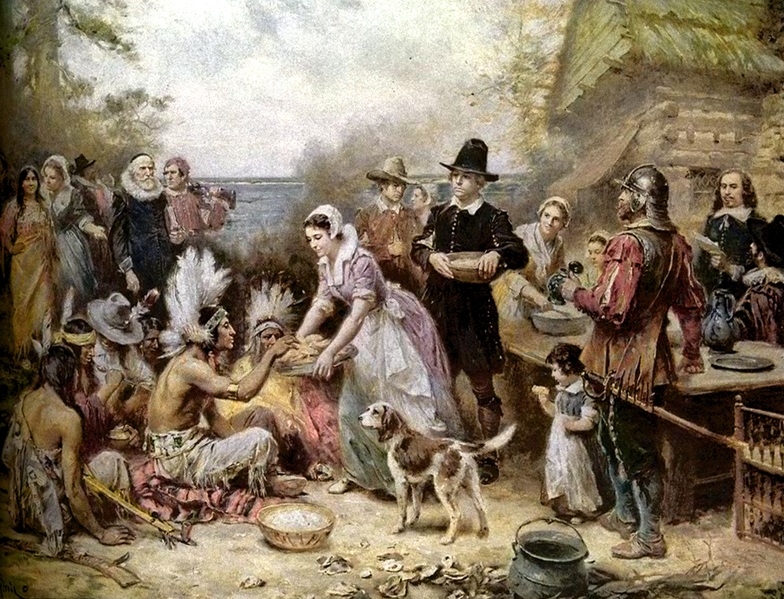 (Initially, while dwellings were being built, the Pilgrims lived mostly aboard the Mayflower.) Due in part to a brutal winter, dozens would die in those first few months, including 13 of 18 wives. In spite of hardships, the Pilgrims were undeterred and drew ever closer to God. The months turned into years and saw the Pilgrims develop good relations with the local natives including Massasoit, a wise and welcoming chief of the local tribes, Samoset, and especially Tisquantum, or Squanto. The Pilgrims informed their friendly guest that they were out of beer, and offered him brandy instead. After a hearty snack of brandy, biscuit, butter, cheese, pudding, and roast duck, Samoset was ready to answer questions. In spite of their difficult and deadly plight, Samoset’s words gave the Pilgrims great cause to thank God. On March 22, 1621, Samoset returned to the Pilgrims with Squanto, who spoke even better English. Squanto’s life is an amazing tale of God’s provision that very closely resembles the account of Joseph from Genesis, chapter 37. Soon after Samoset introduced Squanto to the Pilgrims, a meeting with Massasoit, chief of the Wampanoag people, was arranged. Massasoit, Samoset, Squanto, and dozens of Wampanoag warriors traveled to Plymouth to meet the Pilgrims. With Samoset serving as the interpreter for Massasoit, the meeting was extremely fruitful. A peace treaty and a treaty of mutual aid were struck with Massasoit that would last for decades. Massasoit and his party returned home, but Squanto remained with the Pilgrims. Being a man without a tribe, personally witnessing the desperation of the Pilgrims, and already having adopted their faith, Squanto took pity upon his new-found English friends and wanted to help them succeed in their New World. He taught them how to fish for eels and alewives, plant corn and pumpkins, refine maple syrup, trap beavers, hunt deer, and other skills essential to their survival. Squanto was instrumental in the survival of the Pilgrims—so much so that, according to William Bradford, the Pilgrims considered Squanto “a special instrument sent of God for their good, beyond their expectation.” Massasoit also was an amazing example of God’s providential care for the Pilgrims. Like Powhatan had been at Jamestown, Massasoit was probably the only other native chief on the northeast coast of America who would have welcomed the white man as a friend. In early April of 1621, with supplies running dangerously low, the Captain of the Mayflower, Christopher Jones, decided he could remain in America no longer. On April 5, 1621, the Mayflower returned to England. As the ship disappeared over the horizon, almost certainly a nervous uneasiness came upon more than a few Pilgrims who remained in the New World. Their last ties to their former home were gone. They, perhaps, felt more alone than at any point of their amazing journey. The summer of 1621 was beautiful and, thanks in no small measure to the help of Squanto, bountiful. Governor Bradford declared a day of public Thanksgiving to be held in October. Massasoit was invited. Surprising the Pilgrims, he showed up a day early with 90 of his tribe. To feed such a crowd, the Pilgrims would have to go deep into their food supply. However, Massasoit did not show up empty handed. He had instructed his braves to hunt for the occasion, and they came with several dressed dear and fat turkeys. The Thanksgiving turned into a three-day celebration filled with feasting and games. The First Thanksgiving, by Jean-Léon Gérôme. A few weeks after the first Thanksgiving and about a year after the Pilgrims arrived in the New World, the Fortune sailed into Plymouth on its way to Virginia. 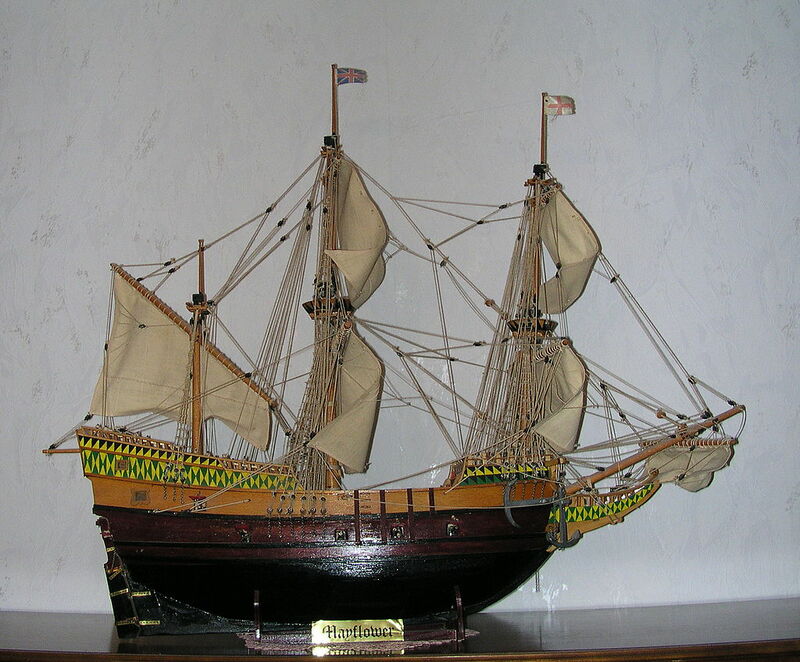 The main cargo was an additional 35 colonists and a charter granted from the New England Company. There was tremendous celebration over the new charter; however, unlike the Indians, the new colonists arrived virtually empty handed. They had no extra clothing, food, or tools. The Pilgrims would have to adjust their winter food rationing plan severely. The winter of 1621-1622 was as difficult as feared. The Pilgrims entered what has been described as their “starving time.” Some reports reveal that at times, food rations for each person were a mere five kernels of corn per day. Miraculously, that winter not one Pilgrim died of starvation. There was no Thanksgiving celebration in 1622. When the spring planting season of 1623 rolled around, the Pilgrims realized that to fend off further hunger and rationing, a corn harvest at least twice as large as last season was necessary. However, a lackluster work ethic prevailed among them. This was mainly because the contract entered into with their merchant sponsors in London required everything the Pilgrims produced was to go into a common store and be shared. As Rush Limbaugh has often pointed out on his radio broadcast that celebrates Thanksgiving Day, the Pilgrims were languishing under socialism. On November 29, 1623, two years after the first Thanksgiving, Governor William Bradford made an official proclamation for a second day of Thanksgiving. In it Governor Bradford thanked God for their abundant harvest, bountiful game, protection from “the ravages of savages…and disease,” and for the “freedom to worship God according to the dictates of our own conscience.” Well over a hundred Natives attended, bringing plenty of turkey and venison along with them. May the light of those first Thanksgivings never be extinguished.